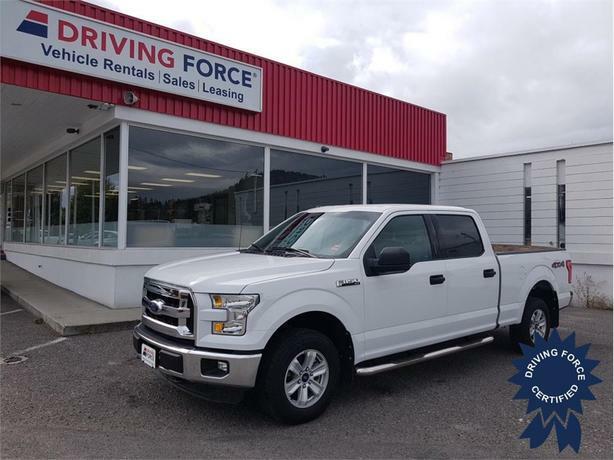 This 2016 Ford F-150 XLT Supercrew comes with a 6.5-foot medium box, 157-inch wheelbase, Pro Trailer Backup Assist, rear view camera with dynamic hitch assist, black vinyl floor covering, Class IV trailer hitch receiver, 17-inch wheels, electronic transfer case, part-time four-wheel drive, block heater, 200-amp alternator, electronic 6-speed automatic transmission with tow/haul/sport mode, towing with harness and trailer sway control, 2,100 lbs Maximum Payload, gas-pressurized shock absorbers, front anti-roll bar, electric power-assist speed-sensing steering, auto locking hubs, 136.3-litre fuel tank, and 5.0-litre V8 gas engine providing 385 horsepower at 5750 RPM and 387 lb-ft of torque at 3850 RPM. The GVWR rating is 7,050 lbs (3,197 kgs). Email us using our web form and one of our truck sales consultants will be with you right away.